Do you head to the gym feeling flat after a long day’s work indoors? Or find it hard to sleep at night despite feeling exhausted? Well join the queue. More than ever people are working long hours in environments with the air-conditioner blasting, bright artificial lighting and an overwhelming connectedness to technology. There is a distinct negative impact both mentally and physically to spending these long hours in artificial environments. Studies have found that people are spending less then 7% of their day outdoors. Which is simply not enough time for our bodies to be truly healthy. We need more fresh air. More natural light. More time moving in and being energised by nature. One of the best things about being in nature is that there are a host of mental benefits for your health that you can soak up even before breaking a sweat. Spending just 90 minutes in a natural environment has been shown to reduce anxiety, promote self esteem and give you a boost of endorphins, the hormone responsible for all those happy feelings. Exercising outdoors is found to be more revitalising and energising than training in a gym environment. In one study, participants found that when active outdoors they felt less tension, anger, confusion and depression while their enjoyment of the activity and level of satisfaction increased. Ditching the treadmill and running outdoors is a great way to reduce the harsh impact on your joints. Your knees can really suffer from the continuous pounding on a firm, flat treadmill surface whereas tracks and trails are far more forgiving. Running on an uneven surface also helps to strengthen the structures in the feet, ankles and knees which aids injury prevention. 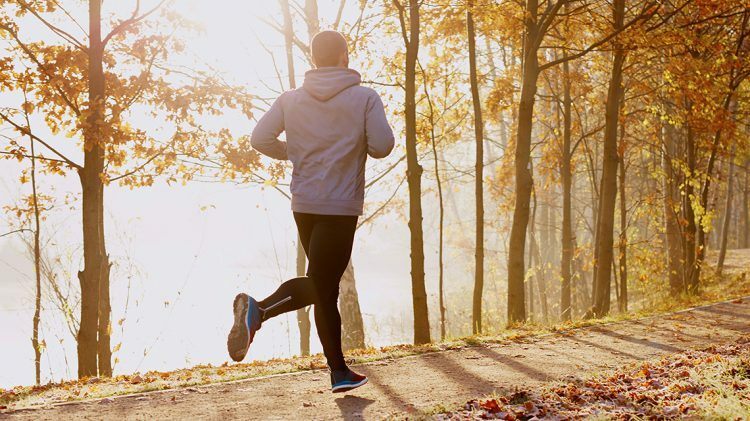 In addition, training outside can help you fight off those winter colds. By breathing in small amounts of airborne plant chemicals that are found in the air has been found to improve your immune responses by 50%. Very simply, we sleep better after a day spent outdoors. Our bodies are stimulated during the day by bright natural light which increases energy, mood and metabolism while suppressing melatonin, the hormone responsible for a good night’s sleep. Without sufficient light during the day sleep becomes broken. 1. Spend 20-30 minutes in the morning outdoors. The natural light signifies to our bodies that it’s time to get energised and then after sunset our bodies more clearly recognise the contrast in light and begin to prepare for sleep by increasing melatonin leading to a deeper and more satisfying sleep. 2. Steer clear of bright lights for about 2 hours before you head to bed. This will allow your body to be more in touch with your natural sleep cycle and result in a higher quality rest. Bright light at night is shown to delay the onset of sleep by stimulating the mind and body while suppressing melatonin. Being more active in your local park or nearby trails is a great way to be more connected with your community. Community connection is shown to have a positive impact on your physical and mental health. Studies show that people with more social support live longer, have increased immunity (especially in older adults) and tend to sleep better. They also have reduced feelings of depression and may experience better memory moving into old age. Training outdoors is just less constrained. No gym fees, no need for heavy equipment, no cramming and no queuing for classes. For primarily these reasons, studies have found that attendance to group training outdoors is actually higher than that in gyms. After a long day indoors, being able to throw on your runners and ‘go for it’, whether it’s by yourself or with your crew, feels like complete freedom. So go on, get out there. Enjoy the fresh air. Soak up that natural light. And be energised and revitalised through training outdoors. Golf came back with a bang!